If you’re looking for a simple, refreshing, and crowd-pleasing favorite, this recipe for chunky guacamole is a festive go-to with a kick. Scoop it over Chicken Taco Casserole, Easy Green Chile Enchiladas, or just devour it with tortilla chips – this recipe is easy easy to prepare and ingredients can be doubled, tripled or even quadrupled if you’re throwing a party! Additional chopped onion, cilantro, radish slices or roses, and a little crumbled Mexican queso fresco or other fresh cheese like feta or farmer’s cheese for garnish. In a medium-size bowl, mix the finely chopped onion and chiles with the tomato, garlic, and cilantro. Just before you’re ready to serve, halve the avocados lengthwise by cutting from the stem to the flower ends, around the pits. Twist the avocado halves in opposite directions to loosen the meat from the pits, then scoop out the pits, and reserve. Scrape the avocado pulp from the skins and add it to the bowl. Using your hand or a spoon, roughly mash the avocado while mixing in the other ingredients, making a coarse, thick mass. Flavor with salt, then enough lime juice to add a little zing. Return the pits to the guacamole and cover with a sheet of plastic wrap pressed directly onto the surface of the mixture. Set aside for a few minutes to let flavors blend. The guacamole is very attractive in a pottery bowl or Mexican mortar, a sprinkle with chopped onion, cilantro, radish slices and/or queso fresco (cheese); radish roses really dress it up! Are you a true Passanante’s food fan? Leave us a review to become a member of our official Food Fans Club and receive special offers, promotion notifications and product information. 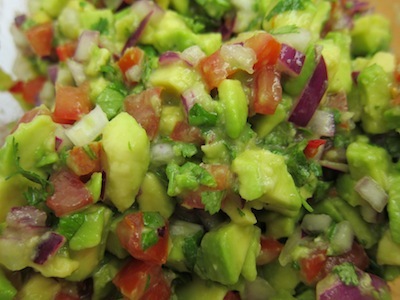 This entry was posted in Recipes and tagged Guacamole, Mexican Recipes, Passanante's Home Food Service, Recipe by Passanante's Home Food Service. Bookmark the permalink.